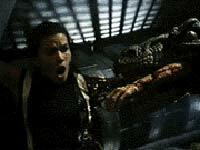 Carnosaur 2 (1995) - Sci-fi-central.com.  USA  1995  83m   Directed by: Louis Morneau.  Starring: John Savage, Cliff De Young, Don Stroud, Rick Dean, Ryan Thomas Johnson, Arabella Holzbog, Miguel A. Núñez Jr., Neith Hunter, Guy Boyd, Michael McDonald, Christopher Darga, Jason Adelman, William G. Clark.  Music by: Ed Tomney. In order to contain the deadly dinosaur menace, the government sends a team of crack troops in, unfortunately when they arrive they discover that they have a potentially hazardous nuclear situation to deal with, as well as hordes of menacing velociraptors. Directed by Louis Morneau & produced by Roger Corman Carnosaur 2 is a massive Aliens (1986) rip-off much more so than the original Carnosaur (1993) was a Jurassic Park (1993) rip-off, the script by Michael Palmer basically is Aliens but with the setting changed. Lets detail the similarities shall we? There's the isolated complex that has had everyone running it slaughtered except for one child. There's the unruly bunch of outsiders including the selfish & uncaring company man whose only bothered about money. There's a scene in which a monster is waiting in the back of the getaway vehicle & attacks the pilot causing it to crash, Carnosuar 2 even has the shot of blood splashing on the windshield. There's the way the survivors have to barricade themselves into the facility & even check blueprints of the buildings on a computer while discussing what to do. There's the plot development that something has happened to the facility & it will be destroyed by a nuclear explosion in a short amount of time just to add to their problems & force them to make a daring escape. There's the scene in which the cowardly character is trapped in a corridor with the tough one who is injured & they find themselves surrounded by Dinosaurs at which point they light some dynamite & hold it together as it explodes killing lots of Dinosaurs allowing the hero & teenage brat to make their escape. There's the electronic facility voice who warns of impending danger & starts a countdown. Neither can we forget the climatic fight between the large Dinosaur & the hero who uses a huge yellow mechanical crane. Every single aspect, idea, theme, character, set or situation could be seen as ripped-off from Aliens, I'm surprised James Cameron hasn't sued & I think Cameron deserves as much credit for the screenplay as Michael Palmer. On it's own Carnosaur 2 is average entertainment, at least it moves along at a nice pace plus there's a fair amount of Dinosaur attacks & on screen action. I've sat through a lot worse. Director Morneau is no Cameron even though he tries to be. Even the lift they use looks exactly like the ones in Aliens right down to how they open with that mesh type grill. The film feels very Aliens & looks it. The special effects are slightly better than the original but that's because the Dinosaur scenes are quickly edited & they only appear on screen for a few seconds at a time. Again it's a mixture of hand puppets, mechanical models & guys in rubber suits, none look particularly convincing. There is a funny scene when the obligatory black guy has a mini boxing match with one of them! The gore is toned down compared to the first film, there's a gory bit when someone has her arm torn off & her guts pulled out but apart from that it's mostly just a bit of fake blood splashed around. 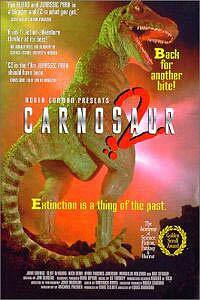 Techncially Carnosaur 2 is OK, it's not the most polished film I've ever seen but it's competent most of the time. The acting wasn't great, no one stood out & I thought most of the character's were bland & dull. Carnosaur 2 is basically Aliens set on earth with Dinosaurs instead of aliens, it's as simple & straight forward as that. It's an alright way to pass 90 odd minutes but it's nothing original or special. 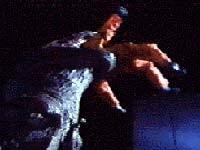 Sequences from Carnosaur 2 were edited into Raptor (2001) & was followed by Carnosaur 3: Primal Species (1996) which is the final Carnosaur film to date. Review by poolandrews from the Internet Movie Database.